Nintendo offered up some news about its newly-minted Amiibo toy line during its Nintendo Direct stream this morning, including a few new models they said are coming this Spring. Pac-Man! 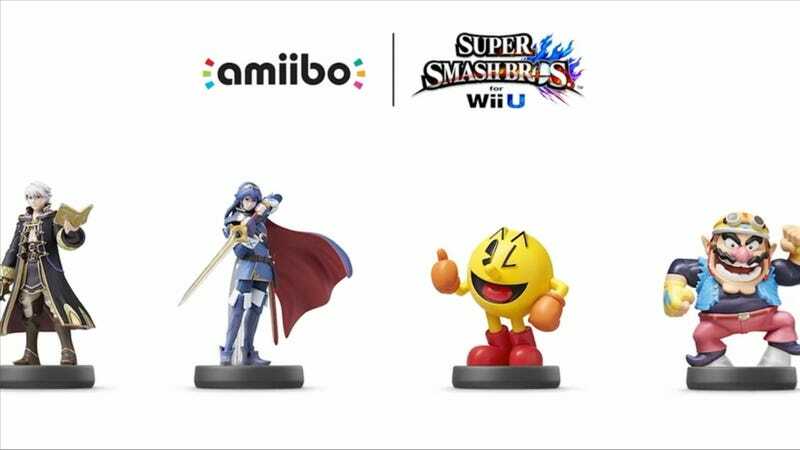 The next round of Super Smash Bros.-centric Amiibo (there are 11 in total) are coming out in February. But we already knew about those. The exciting part for budding Nintendo toy collectors came a moment later, when they announced an incoming line of next-wave Amiibos. These include Robin and Lucina from Fire Emblem, Pac-Man, Wario, Ness from Earthbound, and Charizard—the dragon of Pokemon fame. I wonder if the Wario Amiibo has any farting capabilities (fingers crossed). They didn't give a specific date, but said that they're coming sometime this Spring. In addition to the Smash Bros. line, Nintendo also said it's planning to release a Super Mario line of Amiibo on March 20th. The figures in this series are: Mario (of course), Luigi, Yoshi, Peach, Bowser, and newcomer Toad. I'm not totally sure yet what it means to have specific "lines" of Amiibo for particular Nintendo franchises, honestly. The Peach Amiibo looks slightly different than the first one Nintendo made that's already available, for instance. But do we really need to buy two different Peach toys to use in two separate games?? I know that Nintendo has mentioned that Amiibos won't be able to store data from multiple games at the same time...but, come on. I'm not made of money, Nintendo!! The company did acknowledge that the Super Mario line features some of the same characters as the Smash Bros. one, albeit in a slightly different form. They said that both versions of the Amiibo will work exactly the same way—i.e., you should be able to use a particular Amiibo in one game or the other without any problems. But since this is Nintendo we're talking about, who knows how the service will actually work out in practice once it hits the ground. To check on the compatibility of specific Amiibos and games, Nintendo recommended visiting this site. The Super Mario line of Amiibo is being designed in tandem with the release of Mario Party 10 in March, though Toad's debut also means that support for his Amiibo will also come to the wonderful Captain Toad: Treasure Tracker. They didn't give a ton of specifics about how they'll work in that game, other than to say it'll take things to the "next level." I do love leveling up! Well, ok, that's not entirely fair. Nintendo did say that Mario Party 10 will feature a new gameplay mode known as "Amiibo Party" in addition to the two that were previously announced. This mode works by putting you on a specific game board tailored to the Amiibo that you're using, complete with character-specific abilities and traits. Mario Party 10 will be compatible with nine Amiibos: Mario, Luigi, Toad, Peach, Bowser, Rosalina (and Luma! ), Yoshi, Donkey Kong, and Wario. An important note for current Amiibo-holding Smash Bros. players: Nintendo said that if you switch an Amiibo over to Mario Party 10, it's Smash data will be erased. Lame. In any case, the new Mario Party finally comes out on March 20th, which is three days before my birthday. I know what I'll be doing that night! It'll be interesting to see if the Amiibo game boards in Mario Party end up being a cool new feature, or a lame bit of extra fat like the Smash Bros. side-games so often are. But at the very least, it's exciting to see that Nintendo is building out some substantive Amiibo-friendly features for Mario Party, so let's hope that they actually end up being as solid as the ones for Smash have proven to be. So far, the Amiibos' functionality in other Wii U games has been a bit...slight, to say the least. All they really do in Mario Kart 8, for instance, is unlock different costumes for your Mii racers.